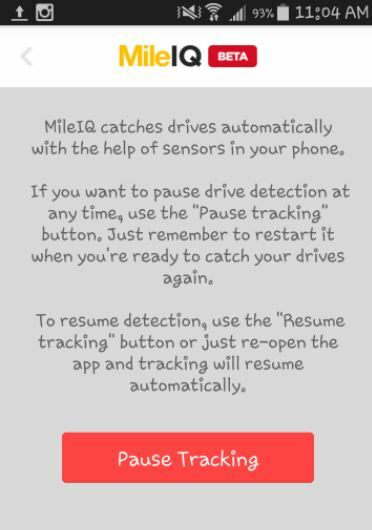 I saw an ad (I think on Facebook) for MileIQ. 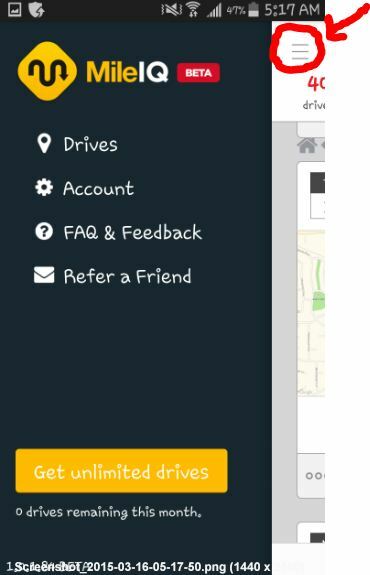 In that ad, MileIQ promised to make tracking personal miles vs business mile easy. Since I know a few people who travel by car for business, I thought I’d give it a try. 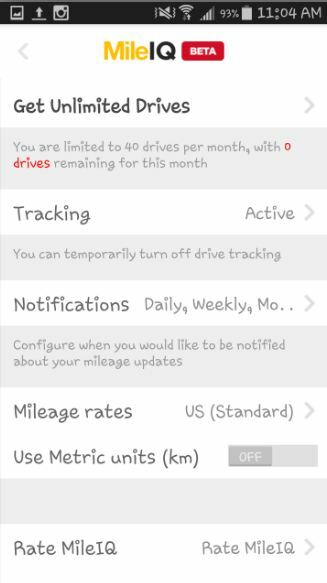 MileIQ is an app for your android or IOS smartphones that automatically tracks your mileage, and calculates the IRS mileage costs, when you are driving. When you are finished with your trip it allows you to swipe left for personal or swipe right for business. 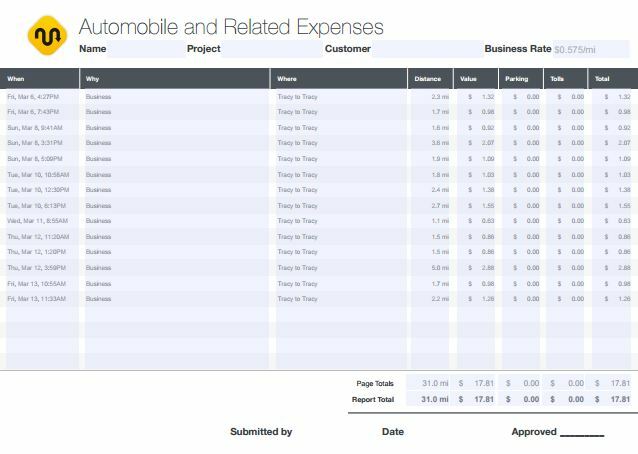 When you need an IRS compliant mileage deduction report (go here for more info on what mileage you can deduct), you simply ask and an email arrives with several versions of the report (CSV file, editable PDF for all my drives, or PDF business only). Special deal until August 17, 2015: You get 10% off your order with promo code “TechyMike” and MileIQ will donate a portion of the proceeds to our 501c3 nonprofit ForCarol.com for college scholarships and classroom supplies. 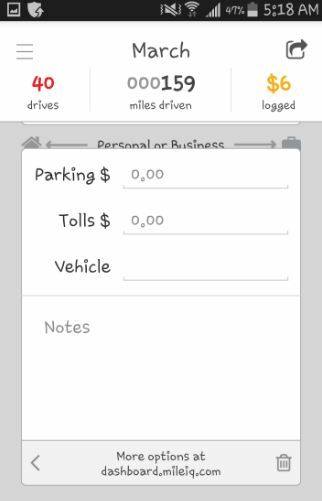 Setting up MileIQ (BETA version 1.0.1.84) on my Samsung Galaxy Note 4 was a breeze. I took the car for a spin, and saw the mileage report and swiped it left for personal. How do they “fix” this? Not a clue, but, maybe they do not want to change this. I mean, for about $6.00 per month MileIQ is a good deal especially if you travel even a little bit for business (even though you have to wait until tax time to see the reward). 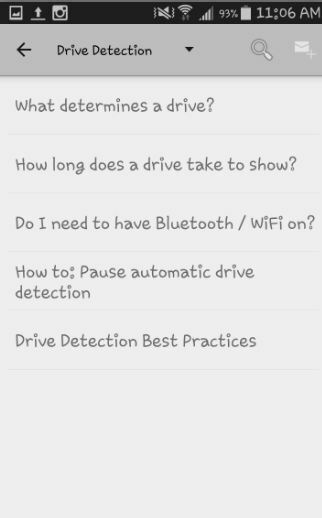 Since I knew my 40 drive free limit was happening quickly, I wandered around the app to see if I could MANUALLY turn it off for personal trips and then manually turn it on for business trips since I take so few business trips. I clicked on the three horizontal bars in the top left corner (not fooling you, see Figure 1, it really is in the top left). And this page showed up. I clicked on Account and got this. Ah! Tracking, that looks like the page I want. I hit the pause button and happily went about my personal driving without the fear of tracking 8 trips in one…..RIGHT? A few days later, I looked and I was at my 40 drive limit. Apparently, the pause did not stay paused (I did NOT go back in and turn it on since I had NO business trips lined up). Oh well, this is a BETA after all, and I, of all people know more about Beta testing than almost anyone still alive. 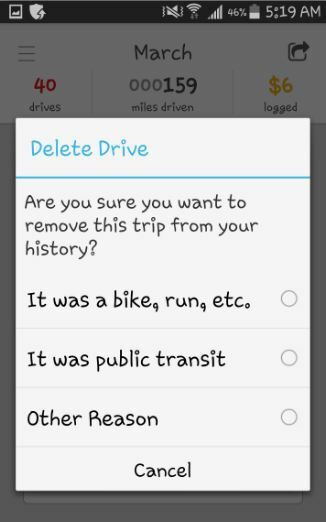 For each trip, you can click on the three dots on the bottom bar (See Figure 1) to pull up the Notes page. Here you can input information pertaining to that trip: tolls, parking fees, vehicle information (Honda? Mileage?) and you can add notes. If you click the garbage can (bottom bar on the right in Figure 1) you get the option of not counting this as a trip (BUT….it still counts against the 40 free trips….I know, I tried). I randomly clicked several trips as one of each of these. I do not see them in the reports below. They have a nice set of FAQs on the app. Very nice, and unexpectedly complete for a BETA. After I categorized, randomly, the 30 or so trips I had not known were there, I asked for a report. I asked for February (in my mind I had the app a long time….40 trips!) and was told I had no trips in February. Hmmmm, I asked for March and was rewarded with an email. Although there are a few things I see that can be “fixed”, overall MileIQ works great and does what it says it does. Since it is only BETA, I am sure this app will only get better with time and iterations. 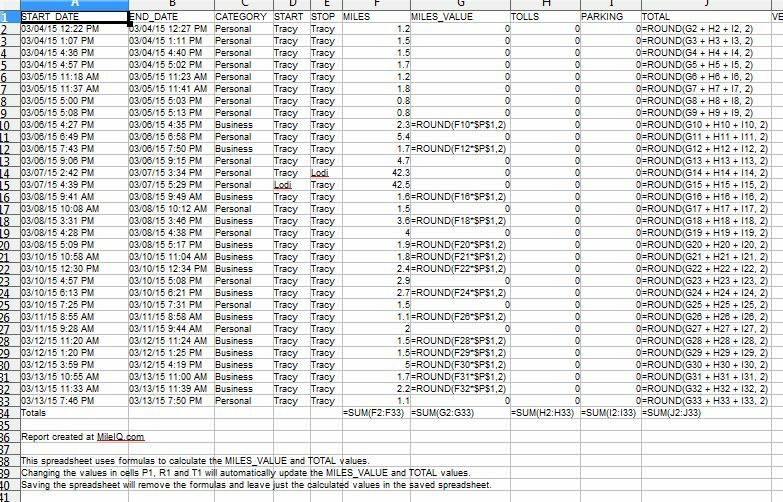 I am impressed with how it easy it is for idiot me to keep track of business mileage, take notes, keep track of expenses, etc. 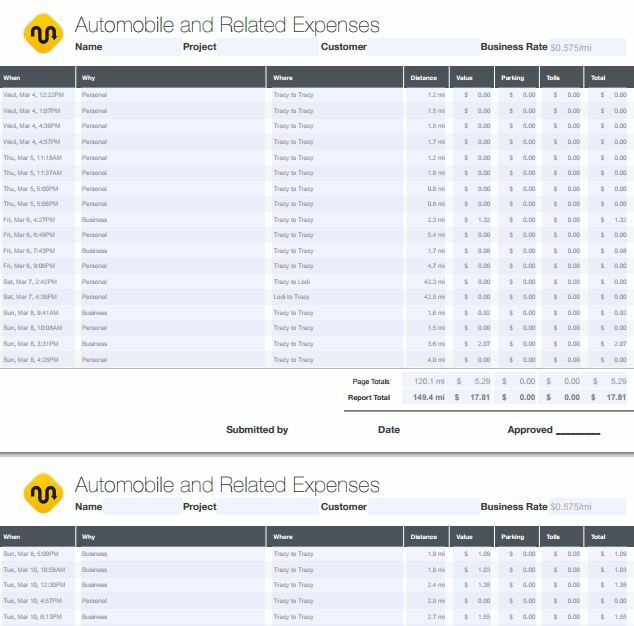 If you are a small business owner, or traveling sales person, MileIQ is definitely worth $5.99 a month. The 40 free offer gets your foot in the door, like it did me, but, I walked thru that door a believer in this product. Oh…..if you are a bad guy, watch out…..MileIQ knows your every move. And no, driving to rob a place is not a business expense. Is it? 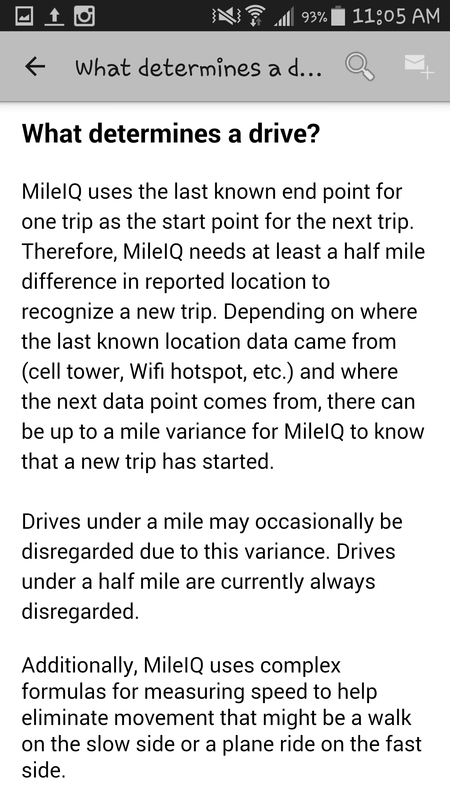 Update: MileIQ sent me their latest version to test…….The new version is terrific. 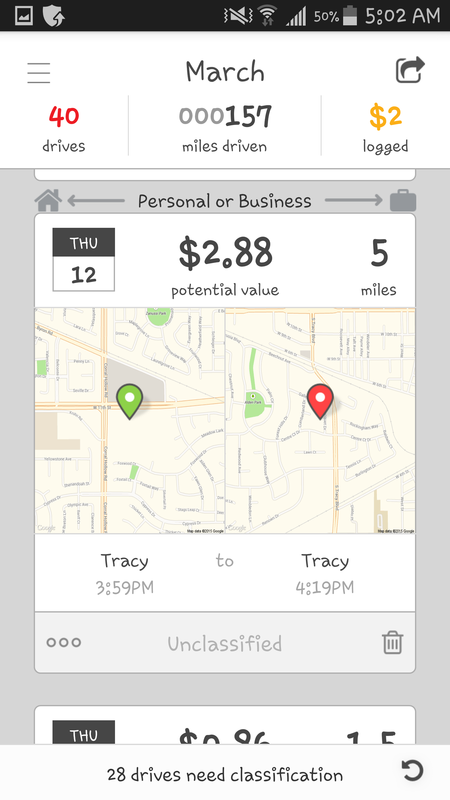 If I were using my car for business and personal….I would use MileIQ.